A masterful performance from Johannes Thingnes Boe saw him celebrate his Sprint Crystal Globe in style with a record-equalling 14th win of the season. Boe already had the Sprint globe coming into the final weekend of the season but he is still looking to complete a historic season with a record number of wins and five Crystal Globes. 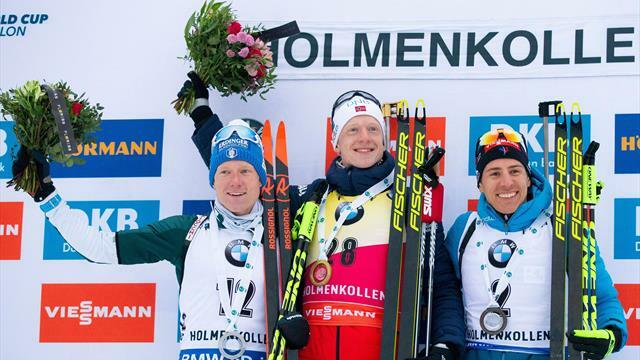 He has begun in perfect fashion with a comprehensive victory in Holmenkollen. Setting off 28th Boe shot flawlessly and quickly in the first shoot, a stark contrast to last Sunday when he fell to pieces in the Mass Start of the World Championships. The world champion was in no mood for any mistakes this time and despite missing once during his second shoot his skiing was blisteringly fast and he finished at 24:39.9, an incredible 31.7 ahead of second-placed Lukas Hofer. It is his seventh Sprint win of the season, out of the nine races. He also takes the Individual Globe. It puts Boe in a fantastic position as the leader of the Pursuit on Saturday, 35 seconds ahead of his nearest rival for that globe Quentin Fillon Maillet, who took bronze. Boe’s older brother Tarjei also started strongly but like his brother missed once during his second shoot and had to settle for fifth in the end.